The NETest-E is designed to provide quick and clear results for testing network cable continuity and wiring configuration. It will detect the most common wiring faults on TIA568A/568B, Token Ring, 10BASE-T, and 10/100BASE-T twisted-pair cables. The faults detected by the NETest-E include shorts, miswiring, reversed pairs, and shielding faults on UTP or STP cables. 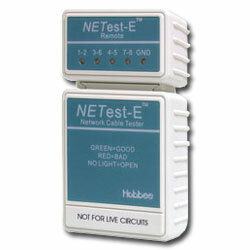 Just plug a cable into the Main and Remote units and the NETest-E will begin testing automatically.